Los Angeles County Sheriff's Homicide Investigators are looking for additional information and leads in the Trinity Love Jones Murder Case. If you feel you have information that would help investigators in this case, we encourage you to call our Homicide Bureau at 323-890-5500. Investigators additionally booked Taquesta Graham on March 18, 2019 for the murder of Trinity Love Jones as the second suspect. The case is being reviewed by the Los Angeles County District Attorney’s Office. Charges are expected to be filed on Wednesday morning, March 20, 2019. Graham’s arraignment for the murder charge will follow the filing on Wednesday at Pomona Court. On Tuesday, March 5, 2019, at 10:00 A.M., the body of an unidentified child, estimated to be between the ages of 8-13 was found by Los Angeles County workers along an equestrian trail in the 3400/3500 block of Hacienda Boulevard, in the unincorporated area of Hacienda Heights. At the time of discovery, the child’s body was protruding from a rolling duffle bag in light brush along the trail. It appeared as though the duffle bag was pushed down the embankment from a turn out along Hacienda Boulevard. On Wednesday, March 6, 2019, at 2:00 P.M., Los Angeles County Sheriff Alex Villanueva, hosted a press conference at the Hall of Justice. A sketch of the victim, the victim’s clothing, and a photograph of a similar duffle bag was released to the public in order to assist Sheriff’s Homicide in their effort to identify the victim, and develop information regarding her death. Following the press conference, hundreds of tips from across the nation, were received from the public via phone, email, social media and “LA Crime Stoppers.” Additional Homicide resources were dedicated in order to follow up on the volume of potential clues. Investigators immediately began to vet the leads/tips. 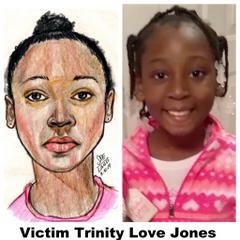 During the evening hours of Wednesday, March 6, 2019, one of the many clues received by investigators alleged that the sketch of the victim provided by law enforcement resembled Trinity Love Jones FB/9. The informant expressed concern, but did not know the whereabouts of Trinity or her mother, Taquesta Graham. Although a positive identification had not yet been determined, investigators began following this lead in addition to many others, to either identify or exclude Trinity Love Jones as the child victim. Over the subsequent days, Investigators began to explore Taquesta Graham’s history and learned of her current boyfriend, Emiel Lamar Hunt. The criminal history of Hunt included a prison sentence for a previous child abuse conviction. Investigators obtained a photograph of Trinity from family members and noted many similarities to the victim. Investigators continued to focus on identifying the whereabouts of Hunt and Graham. Additional leads and tips continued to be vetted toward the goal of positively identifying the victim. Although unknown to Homicide Investigators, on Friday, March 8, 2019, at approximately 6:00 A.M., Emiel Hunt and Taquesta Graham were stopped in Hunt’s black Nissan Armada at a border patrol check point in Hudspeth County, Texas. Graham was arrested for an unrelated warrant and Hunt was released. After her arrest, Hunt began driving back to California. An autopsy was completed on Friday, March 8, 2019, by the Los Angeles County Medical Examiner- Coroner’s Office. The death was ruled a homicide, but the cause of death is not being released as a security hold has been issued. Over the next days, investigators conducted interviews, viewed surveillance evidence and examined evidence in the case. As a result of this follow up, investigators determined that Hunt and Graham were persons of interest in the case and took additional steps to locate them for questioning. On Saturday, March 9, 2019 at approximately 3:00 A.M., Los Angeles County Sheriff Homicide Investigators, with the assistance of Investigators from Los Angeles County District Attorney’s Office, utilized Department resources and information obtained during their investigation to locate Hunt’s whereabouts. 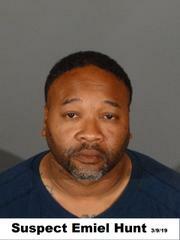 Hunt was found sleeping inside his Nissan Armada in a lot near the San Diego National Airport. He was transported to Norwalk Sheriff’s Station and subsequently interviewed by detectives. He was booked for murder. Evidence and details obtained during the investigation led Investigators to probable cause that Trinity was the victim, and that Hunt and Graham were involved in the death of Trinity. Trinity had not been formally identified by the Medical Examiner - Coroner’s office, although a family representative did identify Trinity for Homicide Investigators by use of a photograph. During the evening hours on Sunday, March 10, 2019, Investigators coordinated with members of Trinity’s family to meet with Investigators from the Medical Examiner – Coroner’s Office. At this time, Trinity Love Jones was positively identified as the victim in this case. Once formally identified, a press release was distributed identifying Trinity as the victim, and that two persons of interest were detained. On Monday, March 11, 2019, Investigators continued their investigation, prepared reports and vetted additional tips and leads. The criminal homicide case of Trinity Love Jones, was prepared and presented to the District Attorney’s Office for review and consideration of filing a formal complaint. On Tuesday morning, March 12, 2019, the District Attorney’s Office filed a formal complaint charging Hunt with one count of murder. Bail was recommended to be set at $2 million dollars. As a part of the extradition process, Taquesta Graham was extradited from Texas to Los Angeles on Thursday morning, March 14, 2019. Investigators booked Graham at Norwalk Sheriff’s Station for an unrelated warrant and she was subsequently interviewed regarding her daughter’s murder. 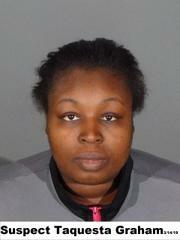 Graham remains to be held in Los Angeles County custody on the unrelated warrant. Homicide Investigators continue to vet community Tips and follow up on additional evidence obtained during the investigation. The criminal case naming Taquesta Graham is being prepared for presentation to the District Attorney’s Office on a later date. During the past week, Investigators learned Graham, Hunt and Victim Trinity Jones moved from a family member’s home in Long Beach in May of 2018. During the past ten months the extended family had only seen or heard from the couple and Trinity on a few occasions. Investigators have learned Hunt, Graham and Trinity were homeless just prior to her death and were residing in a Santa Fe Springs motel or in their vehicle. Investigators announced in the press conference on Wednesday, March 6, 2019, that they believed the victim had been left at the location within 48 hours prior to the time of discovery. Since then, additional information revealed that the victim’s body was actually left at the crime scene during the afternoon hours of Friday, March 1, 2019. There were no open or active Department of Children and Family Services (DCFS) cases involving Trinity. Anyone with information about this incident is encouraged to contact the Los Angeles County Sheriff’s Department Homicide Bureau at (323) 890-5500. If you prefer to provide information anonymously, you may call "Crime Stoppers" by dialing (800) 222-TIPS (8477), use your smartphone by downloading the “P3 Tips” Mobile APP on Google play or the Apple App Store or by using the website http://lacrimestoppers.org. Los Angeles County Sheriff's Department Homicide Investigators are announcing the arrest of Suspect Emiel Lamar Hunt, male Black 38 years-old, for the murder of Victim Trinity Love Jones. From the onset of the investigation, Homicide Investigators worked tirelessly to identify the victim, review evidence and conduct interviews in furtherance of hundreds of tips received from the community. Investigators identified Emiel Hunt as a person of interest and began focusing on his whereabouts. During the early morning hours on Saturday, March 9, 2019, investigators located Emiel Hunt sleeping in his vehicle, which was parked in a lot near San Diego International Airport. He was arrested without incident and booked at Norwalk Sheriff’s Station. Emiel Hunt is reportedly the boyfriend of Trinity's mother, and was recently a Los Angeles County resident. On Monday, March 11, 2019, investigators submitted their case for review by the Los Angeles County District Attorney’s Office – Pomona Court. On Tuesaday, March 12, 2019, one count of murder with a 2,000,000 bail was filed on Emiel Lamar Hunt for the murder of Trinity Love Jones. Suspect Hunt is scheduled to be arraigned later this afternoon. Information regarding the second person of interest is being withheld pending further investigation. The homicide investigation is ongoing. Investigators anticipate releasing additional case information as more facts are established and verified. The March 9, 2019, booking photograph of Suspect Emiel Lamar Hunt is attached. If you believe you have any additional information regarding this case, you are encouraged to contact investigators at Homicide Bureau 323-890-5500. Partner to prevent or report crime by contacting your local Sheriff’s Station. If you wish to remain anonymous, call “LA Crime Stoppers” by dialing 800-222-TIPS (8477), or use your smartphone by downloading the “P3 Tips” Mobile APP or “P3 Mobile” for the hearing impaired on Google play or the App Store, or by using the website http://lacrimestoppers.org. Today, the Los Angeles County Medical Examiner- Coroner’s Office confirmed the identity of the victim as Trinity Love Jones, female Black 9 years-old, a resident of Los Angeles County. Although the Coroner’s Office determined the death to be a homicide, the cause of death is being withheld. Los Angeles County Sheriff Alex Villanueva and Homicide Investigators released a composite sketch of a young girl found dead near a trail in the Unincorporated area of Hacienda Heights on Tuesday, March 5, 2019 at approximately 10:00 A.M. The young girl was discovered down an embankment just south of Colima Road east of Hacienda Boulevard. The victim’s body was dumped at the location in between the evening hours on Sunday March 3, 2019 and discovered at 10:00 A.M. on March 5, 2019 by Los Angeles County workers who were conducting maintenance on an equestrian trail. The victim was found partially inside a black rollaway type duffle bag, similar to the one pictured, where her upper body was seen protruding. Although preliminary investigation initially led investigators to believe the victim was between the ages of seven and 10 years, further investigation with the Los Angeles County Department of Medical Examiner-Coroner determined the victim was a Black female between the ages of eight and 13. The young girl was found to be wearing a pink, long sleeve shirt with gray panda print pants (actual clothing depicted). She stood approximately four feet, five inches tall and weighed about 55 pounds. No obvious signs of trauma were found on the victim’s body. At this time, the incident is being ruled as a suspicious death. Manner and cause of death will be determined by the Los Angeles County Department of Medical Examiner-Coroner at a later date. The motive remains unknown. “It’s a horrible tragic case our investigators are working diligently on to solve,” stated Homicide Lt. Hoglund. Los Angeles County Sheriff's Department Homicide Bureau investigators are continuing to investigate the death of a child near the hiking trail South of Hacienda Boulevard and Glenmark Drive in Hacienda Heights. Industry Station received a call for a rescue response at approximately 9:59 a.m. at the Hacienda Heights location regarding a found body unresponsive. The child was pronounced dead on scene. Investigators believe the body was left at the location over 24 hours ago. The unidentified Black child is approximately 7-10 years-old. Investigators are awaiting the Los Angeles County Department of Medical Examiner-Coroner to determine the gender and identity of the child, as well as the cause of death. Los Angeles County Sheriff’s Homicide Bureau detectives are responding to a hiking trail South of Hacienda Boulevard and Glenmark Drive, Hacienda Heights, to investigate the circumstances surrounding the death of a person. The investigation is ongoing and there is no additional information available at this time.